Enjoy without constraint your stay on the Basque coast! 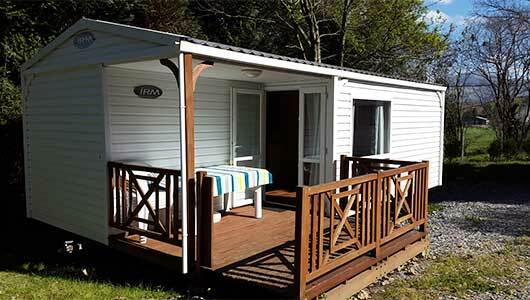 Our mobile homes offer you comfort comparable to that of a traditional home. You will find particularly well-appointed kitchens equipped with the necessary equipment to prepare your daily meals in the best conditions: with sink, refrigerator, cooking fires, coffee maker, toaster and microwave, you will not miss anything! You will also find in our recent mobil-homes a contemporary decoration, quality furniture and many practical storage. A flat screen TV is waiting for you if you want to enjoy a relaxing evening in front of a movie or your favorite show. In the rooms with single beds, you have a 90 cm wide bedding, perfectly adapted to the comfort of an adult. In the different models of mobile homes, the toilets are separated from the bathroom to offer you the best quality of stay. 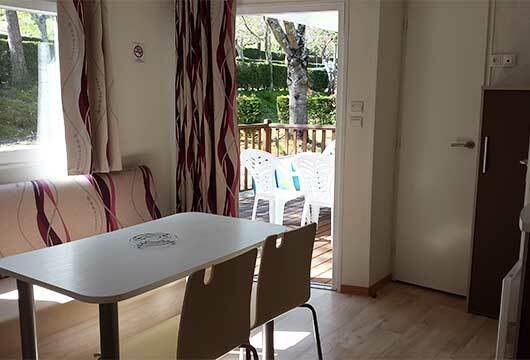 To fully relax during your holidays on the Basque coast, our fully equipped mobile homes also have a large and beautiful terrace. Semi-covered, it offers a sunny part for relaxation and a shady part ideal for meals. Partly integrated under the roof of the rental, these terraces are directly accessible from the living room: they are a comfortable extension to offer you more living space and a beautiful private outdoor area. In a pure spirit of holidays, you can take your morning breakfasts in the sun, share grills and family aperitifs in the fresh air, and savor your summer evenings. Very comfortable, our terraces are intimate thanks to their wooden balustrade. They are also furnished with outdoor tables and chairs. You will find a ceiling lighting, very practical in the off-season or to watch late at night in late summer. Do you prefer traditional camping? See the Camping and Caravanning Pitches in the Pays Basque page. diam vulputate, venenatis fringilla ipsum Aenean dolor sit elit.